Arizona native Cindy McCain, born May 20th, 1954, is the wife of Senator John McCain. An advocate for children’s health care needs, she founded the American Voluntary Medical Team in 1988, and led many medical missions to developing and war-torn countries during the Team’s seven-year existence. Mrs. McCain went to Rwanda during the civil war in 1994, stepping over mutilated bodies to set up medical aid stations. In 2000, Cindy was instrumental in her husband’s notable run for President of the United States. That year, she was chosen to represent the State of Arizona at the Republican National Convention as the Chairwoman of the Arizona Delegation. She serves on the Board of Operation Smile and the Halo Trust, as well as several local organizations. Mrs. McCain has a Master’s degree in Special Education from the University of Southern California. A survivor of severe physical ailments and spinal surgery, she is also recovered from a resultant addiction to pain medication. Mrs. McCain is open about the subject, and encourages awareness of the problem in the spirit of prevention. 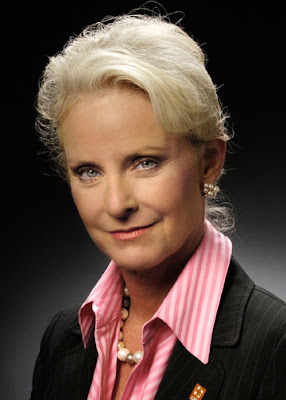 Cindy McCain joined the CARE Board of Directors and the Marketing and Development Committee in 2005.